Itâ? 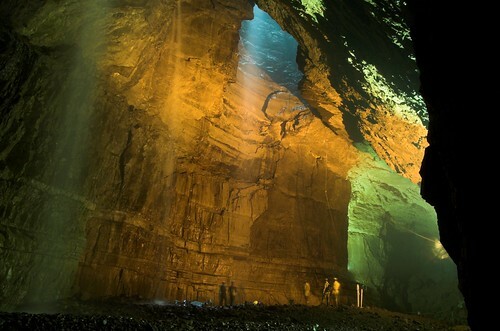 ?s now officially the largest caving system in Britain. The Frozen Deep has just wrestled the title from Yorkshireâ? ?s renowned Gaping Gill – by the equivalent of a large detached house. Nestling under the Somerset countryside near Cheddar Gorge, The Frozen Deep with its vast chamber of stalactites, stalagmites and flowstones has just gone into the record books. At 2,981 square metres in total, it is officially bigger than the legendary Yorkshire cavern â?? by just 252 square metres – after being pain-stakingly explored and excavated by speleologists in the south of the country. The huge chamber â?? around the size of an aircraft hangar â?? contains some of the most stunning formations imaginable, including two pure white columns of calcite rising from the rocky floor. The discovery is testament to the dedication of a team of enthusiasts known as the Tuesday Diggers, a group of local cavers who have been working on the project in their spare time for over four years. Granted exclusive access by the Longleat estate which owns Cheddar Gorge, they had concentrated their efforts on a side passage to the main cave, and broke through to a 20 metre long rift. By removing a large slab of rock, they were able to crawl into what they dubbed the â? ?Resurrection Chamber,â?? which in turn led them to a loose boulder slope with a 12 metre drop at the end. Returning to the cavern with rope and tackle, they descended into darkness â?? to find the largest chamber ever discovered under British soil. The Frozen Deep has been calculated to reach 30 metres high and around 60 metres in diameter, formed by water wearing away the limestone on its journey through the Mendip Hills. The geological outlay of the area has made the Mendips a Mecca for cavers; in some places tonnes of prehistoric animal bones have been discovered, and one â?? Avelineâ? ?s Hole at Burrington Combe â?? has been proven to be the earliest scientifically dated human cemetery in existence, with remains from burials that took place some 10,400 years ago. The discovery of The Frozen Deep has already led to speculation that it may be the start of something even bigger. Cavers everywhere are now asking if there may be a hidden link to the nearby River Cave – and over the next few months work will be undertaken to find out if there could be a connectionâ?¦in what would be an even more amazing piece of underground detection work.